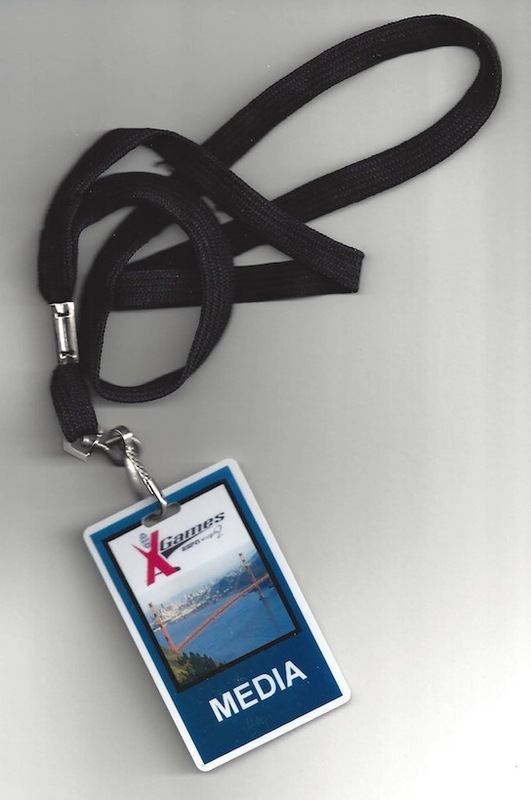 15 Years ago this month, the Professor headed to the Embarcadero, the roadway that runs along San Francisco Bay, to go to the X Games. It started at the end of June, and The Professor wasn’t just attending, he was going with the intent of observing and learning something—about the people, the sports, himself—and writing a short piece about it for a book [Graphis New Talent Design Annual, Graphis Publishers . Although the article was published, it regretably never found a readership. To the best of The Professor’s knowledge, it may have even failed to find a single reader; no comments or feedback were ever received [from anyone, anywhere]. Since this was a significant event, The Professor is putting it online and offering it anew. Here it is as a PDF with the artwork and original page layout if you want to see and/or read the original. In late June and early July of 1999, the X Games made their first appearance in San Francisco. The games—“X” connoting “extreme,” “experimental” and ”Generation X” all at once—occupied a several-pier area along the downtown Embarcadero. Located just a few blocks from the frogdesign office, the X Games offered me the opportunity to experience an aspect of youth culture that I normally didn’t get to see either at work or during teaching duties at school. It is a part of our culture that is mutating, with grace and optimism no less, under the constant strain of commercial pressure and the need for self-expression. Simply witnessing the host of wanna-be-your-friend companies displaying the marketing ineptitude of the mega-corp’s made the X Games worthwhile. But throw in the opportunity to indulge a secret pleasure in watching the athlete-entertainers bonk and go boom, and it put the X Games over the top. As I watched, it became clear that there was much for The Professor to learn from what was taking place. What The Professor saw was a new generation—the generation whose peers are represented in this edition of the Graphis New Talent Design Annual—literally and figuratively stretching and flexing its muscles. Winning mattered, but even more important was the idea of staying true to yourself, your style, and whatever it was that you represent. What an easy thing to forget, The Professor thought, in the day-to-day process of making the business case for design and in trying to sell creativity to those who would just as soon delete it as a line item on a budget! Even in the most commercial aspects of the X Games, there was a kind of purity that The professor admired. It came through in the athletes, but also in the large part of the crowd that avidly participated. They believed. Perhaps the pinnacle moment of the X Games occurred one evening when skateboard legend Tony Hawk pulled off a maneuver known as a “900,” a never-before-achieved trick involving multiple 360º rotations. This guy, the Michael Jordan of his genre, tried time after time to nail the trick. Urged on by the crowd, he finally did it. I came away with immense respect for his accomplishment, and for everyone who is out there trying to raise the level of their craft. It was also clear that we should watch what Hawk’s saying, wearing, using [and earning] in the next few years. If attitude was prevalent, so was authenticity. How you looked doing whatever it was you did mattered. Not trying too hard mattered, unless you took it to Hawk’s extreme level of simultaneous alienation and immersion, and tried so hard that the audience winced [as one] when you bailed. The pure linguistic creativity used to describe the tricks was impressive. I may be jumbling hem together but I heard phrases like “a giant extension off a superman with a seat grab,” “a huge 360-tail whip followed by a back flip with a one-foot X-up,” and “an alley-oop with vert-style air” that moved into “a front-side grind then to a 180-blunt.” That spirit of inventiveness was further evident in the slew of customized products, home-grown and self-invented technologies, and twentysomethings who not only skated, boarded, or biked but also owned their own companies. It was awesome. I think a lot of the people think of the X-gamers as children or misguided youth, but these “kids” aren’t settling for anyone else’s American Dream. They’re building their own, and it’s impressive. I dug the boards and helmets of all different types that were transformed into individual product expressions through graffiti, carefully chosen decals, and the repetition of particular signature moves that have the effect of wearing away certain parts of the product while leaving other areas intact. As a designer, I felt that these customizations pointed out something interesting: too often designers try to create something that is perfect when people really want something that is individualized or even unique. In summary, the X Games represented a moment—the sometimes-seamless, sometimes-contradictory taste trends of the ascendant youth generation were on proud, passionate and profound display. The opportunity to mix with a diverse audience—kids, families, international tourists, wheel and board groupies—was worth any dozen “focus groups,” and [for the time being, at least] , the X Games are free for any and all who want to go. In such a milieu, I felt it was appropriate to be both humble and inspired. To watch, listen and learn. I loved the X Games for what they were, but also for what they represented: the freedom to go, and to go big. I got to spend time with a rare species of human, one that believes implicitly in what it does. Whether you believe in it from a spiritual or secular point of view, that sort of thing is just good for you. It connected me to something essential. X-gamers, just like the students in this book, reminded me again that there is no need to make a distinction between our life and our art. And that’s why they call me The Professor.